Todd Thorniley, a 2014 Penn State Behrend biology graduate, now works as a quality control technician at Southern Tier Brewing Company in Lakewood, New York. On Wednesday, March 25, he was one of the alumni who returned to Behrend to educate current School of Science students on the opportunities available to them during the Career Roundtable for Biology and Chemistry Majors. For a biology or chemistry graduate, there’s no shortage of opportunities. Environmental consultant, genetic counselor — even a quality control technician for a brewery. 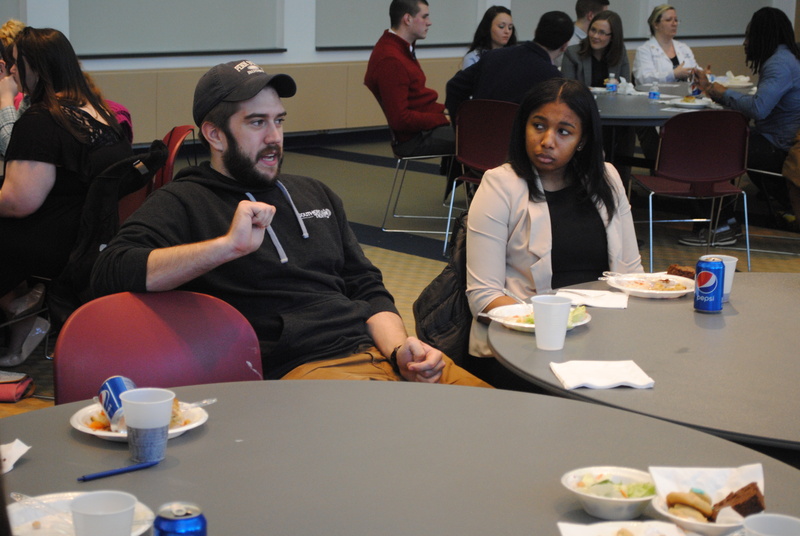 Emphasizing the diverse career paths available to students was one of the purposes of the Career Roundtable for Biology and Chemistry Majors, a networking event hosted by the School of Science at Penn State Behrend on Wednesday, March 25. Designed like a round of speed dating, professionals who work in science-related fields were seated at tables in McGarvey Commons. A group of six to eight students was also seated at the table. For ten minutes, professionals discussed the tasks, challenges and requirements of the jobs they perform every day. At the end of ten minutes, the professionals moved on to the next table, and the process repeated. During the two-hour event, more than 100 students interacted with 10 professionals, many of whom were Penn State Behrend alumni, representing companies that included Michael Baker International, the Pennsylvania State Crime Lab, PerkinElmer Genetics, Southern Tier and Lake Erie College of Osteopathic Medicine. One of the alumni in attendance was 2013 graduate Leah Wolfe, who attended the same event while she was a student. Denise DeVore, a sophomore biology major, was one of the students in attendance at the Career Roundtable. She hoped the event would have the same effect on her that it had on Wolfe years earlier.